Happy Spreadsheet Day! I hope you're making time to cell-ebrate this special day. October 17th was selected as Spreadsheet Day, because that is the date that VisiCalc was first shipped. The theme for this year's Spreadsheet Day is Student Spreadsheets. If you have uploaded a free, useful template or add-in for students, or posted a spreadsheet tip, please send me the link so that I can share it. Or, post your links/tips on Twitter, using the hashtag -- #spreadsheetday – so we can find them. My contribution for Spreadsheet Day 2011 is a Student Time Tracker. You can keep track of your lecture hours, and course work hours, to see what the weekly totals are. To start, you'll enter the Semester start and end dates, in the blue cells. Next, enter your courses, and the scheduled lecture and lab hours per week. As the semester progresses, enter any assignments that you get, and other tasks, like preparing for tests and exams. As you finish your assignments, enter the completed date and actual task time. This will help you improve your time estimating skills. 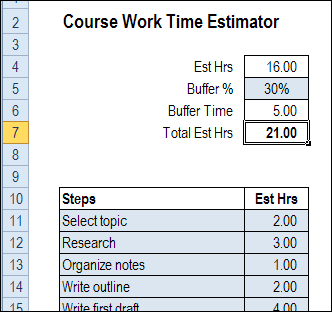 For large assignments, you can use the Course Work Time Estimator sheet, to enter all the steps, and the time each step should take. Then, add a buffer percentage, to include extra time in the estimate. This will cover all those little things that can go wrong along the way. 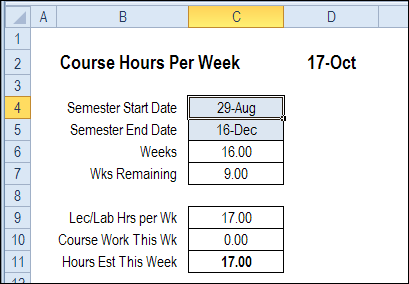 On the Weekly Hours Time Estimator sheet, you can see the total hours for each week in the semester. The Work Hours are calculated by using the SUMIF function to get the hours for each week. At the top of the sheet, enter your target hours for each week – the maximum number of hours that you want to spend on classes and assignments. In the screen shot below, the target is 25 hours (that's pretty low! 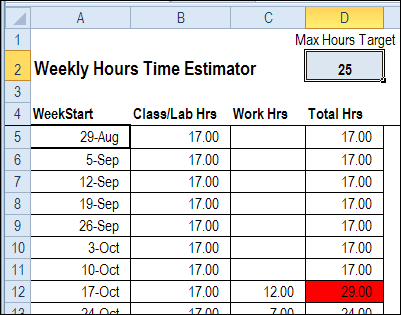 ), and there is conditional formatting to highlight weeks that exceed that target. If you see a heavy week coming up, you might be able to complete some assignments early, to ease the workload. The file is in Excel 2007/2010 format, and zipped. There are no macros in the file.